In the art of video editing, there are a lot of subtleties. One of them is a replacement background for the video. Knowing replacement technology background, videomontajes can achieve the most unusual and spectacular results, and their videos will amaze and delight audiences. 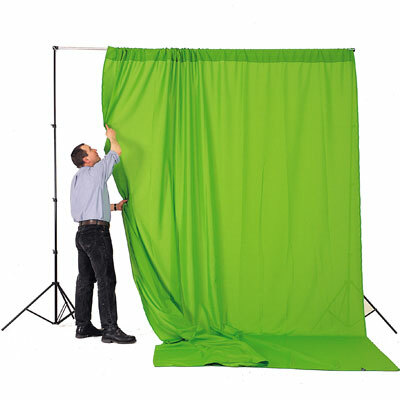 To replace the video background, you must shoot the desired shots on a plain and uniform background (green or blue) and then in the processing of video to use the Chroma Key effect in Sony Vegas program Pro. The captured video will be download in Vegas Pro and then run the Chroma Keyer effect by selecting it from the list of basic effects. Then, to make a more subtle and thoughtful setup, disable the effect in the Video Event FX window. Take in the toolbar of the eyedropper in the preview window click on the color backgroundthat you want to retrieve from the video. Re-enable Chroma Keyer, to green background has disappeared. However, to end the background is not removed. In order to completely get rid of background and to prepare your videos to overlay on the new background, then set the option Show mask only. In the mask mode to view which objects are black and which are white. The background that you want to delete, should be as black, no white and grey inclusions. Modify remove background in mask mode – this setting adjust the high threshold. The result of the correction of the main video object should be completely white and the background should be completely black. Then adjust the low threshold to eliminate the remaining fragments of the background. Be careful that the edges of the main object of the video was not injured. Disable the mask mode. Apply to the video effect, Chroma Blur and set the maximum value to blur the edge of an object and get rid of the colored halo, which may be left from removal of the background. Restart Chroma Keyer and set a small value of the Blur Amount. Put video on a new background. Removing the background is fairly frequently performed operation as when processing photos and videos. The main difference is that in video you are not dealing with a single image, or a sequence of frames, which differ from each other. Import the video from which you want to remove the background in After Effects. To do this, select the File Import command of the File menu. Select the file for processing in the window that appears and click "Open". Using the mouse, drag the imported file to the Timeline palette. If the object that you are interested in taken on an evenly lit green background, remove the background using the Color Key effect. In order to do this, locate the effect in the group Keying palette Effects&Presets. For quick search, enter the name of the effect or the word color into the search bar at the top of the palette. Drag the icon of the effect on the processed video in the palette Timeline. Set the keying parameters. To do this, the Effect Controls palette, click the eyedropper icon and specify by using this tool the color you want to remove from the video. If the background is not completely gone, increase the value of the Color Tolerance.To fine tune use the Edge Thin and Edge Feather. The increase in the value of the first parameter will make disappear a certain number of pixels at the edge of remaining visible image, and the increase in the value of the second parameter will create a number of semi-transparent pixels at the edges of the image. It is pretty comfortable if the edges of the foreground object after the key was too harsh, but don't overdo this option. By increasing the value of Edge Feather, you may get a shimmering translucent halo of pixels around the image. Put the video background and look at the result. To do this, import the file with the background or create a new layer by selecting Solid team the New menu Layer. In the opened window select the color background and click OK. Move the layer with the background under the layer with the effect with the mouse. Start video playback by pressing the Spacebar. If you are satisfied with the result of applying the effect, import into the program background to which you want to overlay the video or save the file with an alpha channel, if you are going to work with it in another editor. Select Add to Render Queue from the Composition menu. In the palette Render Queue click the Lossless label to the right of Output Module. In the preferences window, select output from the drop-down list Channels channel RGB+Alpha. If you want video with audio, check the Audio Output checkbox. Click on the labels to the right of field Output to and specify the folder in which to save the processed video. Click on the Render button and wait until the file is processed.